Sometimes the littlest thing can make the BIGGEST difference. Technically we were on a winter homeschool break this week - no scheduled classes at Classical Conversations. But, we have been doing a little bit of school since we are home and might want some vacation days in spring. 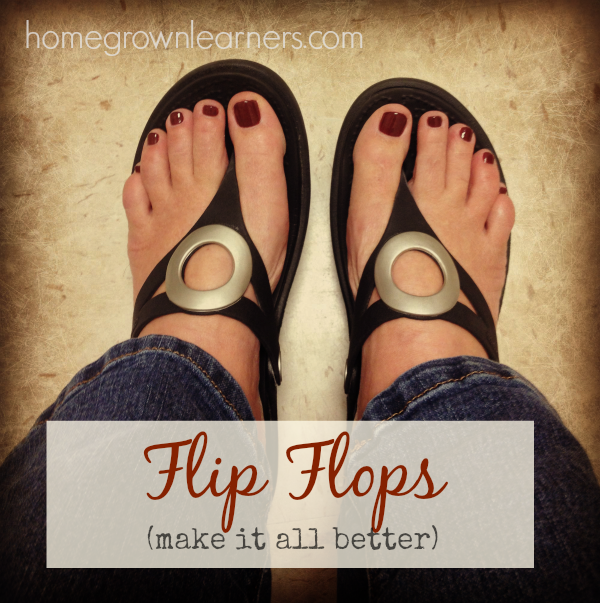 This week the temperatures got above 60 and I pulled out my flip flops. Just seeing my toes and being warm is enough to make me happy, but my favorite flip flops make me even more happy. Don't you love the picture of my 42 year old feet? That's what you call "no fear" blogging! I even played lots of basketball in these shoes this week. It's good this week was just light schooling and no CC or other extra activities, because there are a lot of changes going on in our life right now. I can't go into everything here just yet, but they are GOOD changes that I might be able to blog about soon. Baseball practices started again this week, so we went to a virtual indoor batting cage to revive our baseball skills. Wow. Batting cages have sure come a long way. Grant had a great time and is ready for an awesome season with the same team he played on last fall. The CC history sentence was about WWII, so while I was reading aloud to the kids this week, Grant colored lots of different sheets abotu WWII. Coloring is a great way to keep little hands busy while reading aloud. Our grammar memory work was about verbs. 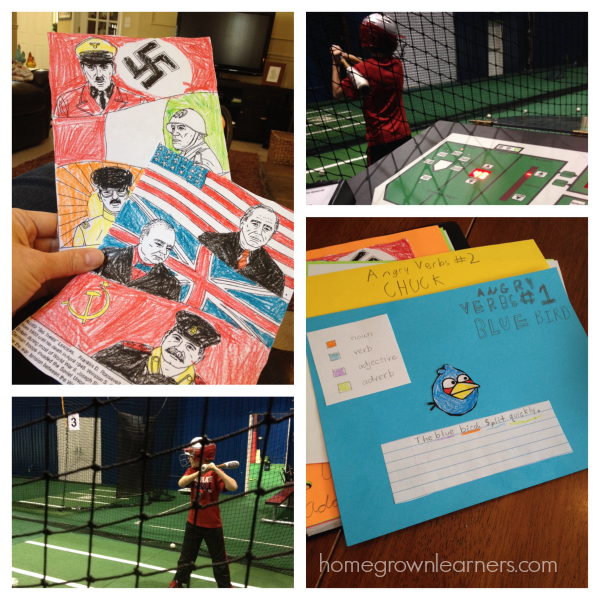 I found the most adorable "Angry Verbs" activity on Pinterest and Grant did several of these. This was a lot of fun! We've been using the StoryStarter product for a year now and it yields wonderful results and is just FUN. Recently, LEGO® Education came out with an app to go along with the StoryStarter set. Grant likes this better than the software on the computer and was learning how to use the app this week. When people contact me wanting to know what LEGO® Education product I recommend I honestly have to say "all of them", but if you are looking for a curriculum that teaches creative writing in a fun way that is geared for the elementary child, StoryStarter is my pick! Perhaps the most valuable lesson she is learning in this first year of the Challenge program is that HARD WORK IS REWARDING. As I sat with her during a Latin lesson and we closed the books after an hour of solid work she said, "I don't look FORWARD to doing Latin, but I feel so proud when I finish a lesson." I thought that was incredibly insightful. And, as I am reading in Leigh Bortins' The Question, this hard work will eventually produce in our children a DRIVE for inquisitiveness and a yearning for more hard work. This initial year is difficult, but I can already see it bearing much fruit. 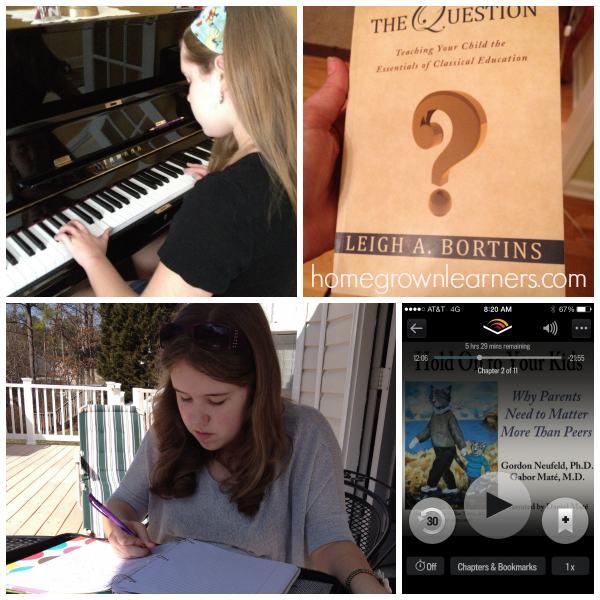 Several long time readers of the blog have emailed me asking how I feel about all of Anna's curriculum being prescribed by Classical Conversations. Doesn't Anna miss so much of the interest led learning we used to do? Don't I miss having so much control? I sense a blog post coming in that answer, but I can say right now that the beauty and depth of the Challenge program far outweighs any concerns I have. This method of learning is so rich and meaningful, and I am pretty sure I couldn't come up with all of this wonderfulness (is that even a word??) on my own. Yes, we still take interest led tangents, but not as many. We are learning to trust this process and most of all, trust GOD. I've also been listening to a book on Audible - Hold On To Your Kids. For parents of "big kids" this is a very good read. It analyzes how our culture has come to blindly accept that children just rely on their peers more than their parents, and what damage this is doing to our society. Like I said - a GOOD READ. Another book I have been reading is Honey for a Teen's Heart - another awesome resource for parents of big kids. I didn't anticipate the response Having the Courage to Be Different: No Fear Homeschooling would generate. This post received the most traffic in a single day since I have been blogging. 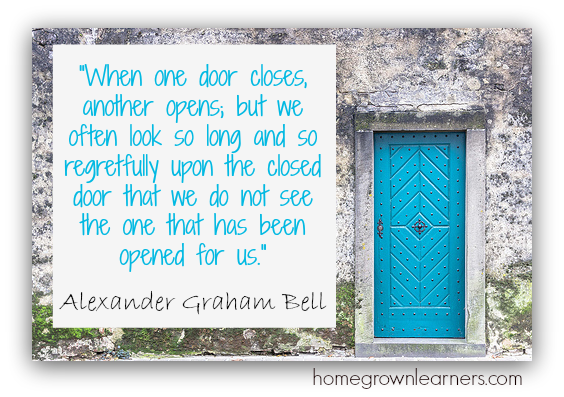 It contained some advice for my younger homeschool self, too... there are times when I wish I could get a homeschool "do-over", but then I remember that all of my experiences are from God and nothing is wasted or an accident. I have found that when I speak MY truth it resonates... I don't sugar coat my feelings. I think my experience can help moms who have been in my shoes, and there are a LOT OF THEM out there (moms, not shoes - ha! ).